It has its own Facebook page with many more photos, news and details of upcoming events, and its history is here. A community orchard of 14 native English fruit trees ( most of which are native to Bedfordshire) was planted in December 2011 in Astral Park at the sout-eastern end of Middleton Way, following a consultation with local residents that was organised by the Southern Residents Forum and the granting of permission by Leighton Linslade Town Council. 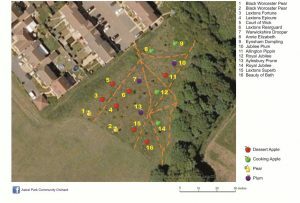 The Greensand Trust provided the initial funding of £500 , and carried out an initial ecological survey. The orchard is also managed for flowers and for wildlife generally; as well as planting the fourteen trees , we agreed with the Greensand Trust and LLTC to manage the area in a way that supported wildlife, so we left the hawthorn trees and brambles in the orchard area as they are so good for the birds and pollinators and other insects. We leave grass long in some areas so that there is space for hibernation and nesting of pollinators and other insects. Working with local residents and volunteers from South Beds Friends of the Earth, we scythe part of the area in late September and we are experimenting with some spring cuts and raking off the grass to reduce soil fertility, which will encourage more wildflowers. After we started doing this we noticed an increase in the agrimony, hedge parsley, vetch and clover. We also lead wildflower walks on the orchard awareness days. The generally wild appearance of the orchard area has helped protect the apple trees from vandalism. 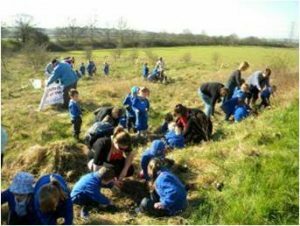 Thanks to a grant of £50 from the Town Council, we planted wildflowers with Leedon Lower School in spring 2012. The knapweed planted by Leedon Lower school still supports Marble White butterflies. and old favourites like bobbing for apples and various eco games, as well as seed collecting and surveys of plants and insects. Over the years we’ve held a number of events related to the orchard, including an awareness day in July 2016 as part of the Jamie Rhythm of Life Fundraiser with the Community House, wildlife surveys, an orchard workdays to learn how to scythe the grass, an Apple Day stall on Leighton Buzzard market in October, Wassailing ceremonies in January 2017 and 2018, and pruning sessions. Results of the surveys have their own pages here.